Once again there was a poor turnout for yet another quality prog band playing the capital as part of a low-key UK tour. Only around 100 people including the bands is disappointing for a class act like Green Carnation, but the Norwegian’s profile over here is rather low and as they are on the smallish French label Seasons of Mist, that situation seems unlikely to change without the band getting out there and playing. I was intending to miss both the opening band Desolation and Derby-based Black Metallers Cruel Humanity, but the latter were still onstage when I arrived. Rather than playing the shrieky, blast-beat powered old school variety of Black Metal, I was pleasntly surprised to see that firstly the four-piece included a keyboard player and that secondly their style of ‘Black Metal’ was quite progressive in nature and much more melodic than I had been expecting. The Death Metal vocals were not so prominent as to distract too much from the music that certainly seem worthy of further attention. I’ll definitely consider checking them out, next time that they play locally. The disadvantage of 3-band bills is that the length of headliner’s set is also shortened, so I was getting worried when the clock reached 21:30 and the headliners still hadn’t appeared. Fortunately the changeover between bands did not take too long we did not have to wait much longer for the six-piece to take to the stage. 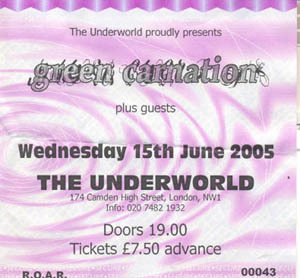 With a lineup that includes the ex-bassist of Black Metal legends Emperor (on guitar) and a heritage that includes cult band In The Woods, the members of Green Carnation have an eclectic background, which shows in their music, which is decidedly progressive in nature, encompassing all manner of shades of light and dark and composition varying in length from 4 to 60 minutes. Besides the more obvious influences, I also hear a heavy dose of 1970s King Crimson in their music, particularly in the lighter songs and in some of the keyboard textures. The opened strongly with Crushed to Dust the vocals being shared between bassist Stein Roger Sordal and main vocalist Kjetil Nordhus. I was delighted as they continued with Just When You Think It's Safe, one of my favourite tunes from the band’s most recent album The Quiet Offspring. It sounded louder and much heavier being played live, but fortunately the soundman managed to find the correct volume controls in time for us to hear the rich organ tones of Kenneth Silden’s solo. There was also an excellent, if slightly showy solo from Michael Krumins, who was much more prominent throughout the show than his more famous fellow guitarist. Kjetil, most recently seen here in London as the vocalist for Trail of Tears, welcomed the crowd and announced that it was the first time that the band had played the UK (not strictly true as the band did play in Dublin, during May 2004) and the set continued with Myron & Cole. Most of the material came from the band’s last two albums with Rain and Lullaby in Winter representing A Blessing In Disguise and The Quiet Offspring being represented in the form of the title track and the sensational Everlasting Moment, though Dead But Dreaming was slightly spoilt by some feedback problems. However the crowd was not going to allow them to leave without playing something from their concept masterpiece Light of Day, Day of Darkness, but this does present the band with something of a dilemma as the album consists of a single 60 minute piece of music. Whilst most of us present would, I’m sure, loved to have heard the entire album, compromises must be made and we were treated instead, to a lengthy section of the piece. Kjetil apologized, "Sorry it’s not the whole thing, but it’s a good piece of it", but even so, the 25 minutes or so that were played were sufficient to satisfy the crowd who cheered loudly as the song came to an end. The selection of pieces that were played gave everybody in the band an opportunity to shine, particularly during the instrumental passages, where the keyboards of Kenneth Silden dueled impressively with Michael Krumins guitar. Also worthy of comment with Kjetil’s excellent vocals and the fine backing vocals supplied by Stein Roger Sordal amongst others and the drumming of Tommy Jackson. By contrast, Tchort seemed content to stay out of the limelight. While I might have liked the sound to have been a little better balanced, I still left the venue feeling very impressed by what I had seen and heard and I’m now very much looking forward to the band’s appearance at Progpower Europe in early October.